Watching this excellent (I believe amateur) documentary by Thomas J. Falletta about how Jon Stewart and Stephen Colbert have affected US politics made me wistful for something similar in the UK. Given the number of clips used in my posts it should come as no surprise that I am an unabashed fan of The Daily Show and The Colbert Report. Both shows take an intelligently critical view on political issues and politicians with great wit and with writers and hosts who are clearly well informed. Sadly in the UK, since the demise of Spitting Image, we do not have anything that comes close to what TDS and TCR produce 4 nights a week on Comedy Central – a few (Marcus Brigstock, Rory Bremner et al) have tried over the years but ultimately failed to match the quality of their American counterparts. It would not, however, be fair to lay the blame for the UKs inability to produce truly biting and popular political satire on TV at the feet of comedians. British comics have a couple of significant handicaps when it comes to broadcasting. To ensure that news, in whatever form, is reported with due accuracy and presented with due impartiality. To ensure that the special impartiality requirements of the Act are complied with. The fact that we do not allow our TV news to be ‘unfair and unbalanced’ means that Fox News or its equivalent cannot contaminate what is already a polluted pool of news sources. Given the volume of jokes and amusing observations that both Jon Stewart and Stephen Colbert make about Fox’s ‘reporting’ that is a problem for British satirists (although I would call it a ‘high quality problem’ and would never want or support a Fox News equivalent in the UK). It is a mystery to me that any so called ‘newspaper’ (see my many references to the opinion sheets known as The Daily Mail, The Sun and The Daily Express elsewhere on this blog) can publish opinions and call them news. The second issue is that, despite the number of idiotic numpties that sit in both houses of parliament and a veritable ocean of stupid and contemptible announcements made by MPs and Lords on all sides, broadcasters are prevented from showing us our MPs worst bits. British MPs limit the broadcasting of their deliberations by controlling the copyright. This means that they can and do refuse to allow anything that happens in the house to be used for comedic purposes. No one likes to be laughed at but I would argue that by not allowing us to see our MPs making hypocritical speeches, talking through their hats or simply sleeping on the job they are perverting the electorate’s view of parliament and making us even more suspicious and disconnected from politics. Worse still, they are preventing good comedians from producing high quality and contemporary political satire! The time for allowing the public to see a warts and all version of what happens in our so called mother of parliaments is long overdue. There should never have been copyright protection for what happens in our parliamentary proceedings. If a politician lies or is constantly changing their publicly expressed views when speaking or voting in the house then the public has every right to be informed and the way to reach most voters is not really through the news it is by humorous berating and general mockery. In the UK we do now have the 10 O’clock Show, an occasional satirical news program on Channel 4. Fronted by, amongst others, by Charlie Brooker. This is a clip on UK/US News from his BBC Screenwipe show. Thank you for your brief guide on regulatory blocks on good political humour. Surely a huge disclaimer a la South Park, stating ‘this is not a news show, it is satire’ would work. A question which I cant be bothered to wiki…. I am right in say in that only parliamentary deliberations are copyright? 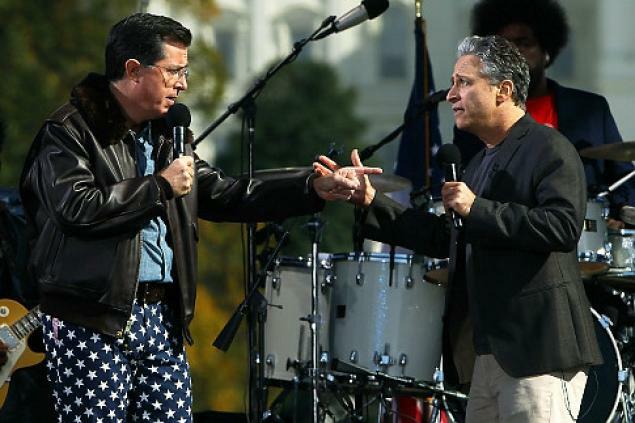 I came to this because of the big love and tremendous respect I hold for Steward and Colbert, the rays of light in an otherwise really dumb current affairs TV schedule in the State – PBS and NPR and S-Span excepted and distinctly unfunny — Radio 4, BBC and BBC Parliament for the colonials. Speaking of which you’d never have got the classic White House Correspondents dinner speech Colbert unloaded at an unwitting George W, Bush…. I digress. What I propose is that by all means necessary we do a like for like exchange for 1 swap of our current affairs and satire artists for 1 year. Just on the understanding that we NEVER have to take Pierce Morgan back. You’re welcome America. Jeremy Paxman/Bill O’reilly – just to show them what quality tv news and opinion looks like. Steven Colbert – John Steward / Charlie Broker / David Mitchell – It would be a good swap for us both though kudos to John Oliver who did and A1 job….. can we have him back now please America? An interesting idea! I certainly agree about Colbert’s speech at the WHCD – although Bush and Fox News both found it painfully unamusing as I recall! America is welcome to keep Piers Morgan until he expires or is charged with phone hacking and we need him back here to appear in court! Hey, man! Thanks for sharing my video! Really interesting post, too! It’s a really interesting, well made and enjoyable video – so thank you for putting it together!! I appreciate your kind and generous comment about my post.